Located in St. Charles County real estate, homes for sale in Troy MO are located just 60 minutes outside of St. Louis. Troy MO Real Estate and Troy MO properties are a perfect addition to the St. Louis Real Estate market. Homes for sale in Troy MO range in price from $50,000 to $4500,000. The median home price in 2014 was approximately $150,000. Residents of Troy enjoy specialty stores that line the historic Main Street district along with tasty hometown restaurants. Troy also features a great park system with walking trails, playground and duck pond. This area is known for its rural charm. Troy properties are served by Lincoln County R III School District. See Great Schools for up to date ranking on every school in the area. If you are looking for a home for sale in Troy MO or you would be interested in buying a home in Troy, please contact Lincoln County real estate expert, Sharon Colona and St. Louis Realty for a professional and simple buying or selling process. Call (636) 397-7653 or email at scolona@stlouisrealty.net. All Brick 1.5 Story home on 15 +/- Acres. Home features 10 ft ceilings on the main level with inverted vault ceiling in the great room and full masonry fireplace. Beautiful oak stair case to large loft area and 2 bed rooms with 1 full bath. Kitchen has granite counter tops and 42white cabinets. Home has formal dinning room, large master bedroom on main level with large master bath with separate shower and jet tub. House also has 18x36 in-ground pool. A 36x72 horse barn with lean to on the back. 7 horse stalls all have nelson auto waters. Large tack room and office with full bath heated and cooled which could be converted to an apartment if needed. Lots of white vinyl fence plus a view of a one acre lake. Additional 1,200 Sq ft finished basement with full bath and kitchen area. New roof done in June 2015, in 2016 new furnace, A/C Unit, and hot water heater. This property has no restrictions. Agent Owned. Breathtaking custom built home, tucked away on over three and a half acres! Main floor boasts great room with vaulted, beamed ceilings, fireplace with imported mantel, and access to 15x46 cedar deck. The chef in your family will be delighted with the kitchen featuring custom KraftMaid cabinetry, granite countertops, copper farm sink, custom 48 x201D;Capitol 6 burner gas stove with double oven, walk in pantry and wine bar! Main floor master suites offers luxury bath with heated floors and walk in closet with washer/dryer hook up. Amazing space upstairs includes two generous bedrooms, full bath, and bonus space perfect for office or studio. Lower level has been finished as well, and designed to entertain! Wet bar, loads of space for gathering and hobbies, huge family room with additional fireplace, and large room currently used as a work out room. Walking distance to the park, minutes from the interstate! Enjoy small town living AND a luxurious home! Priced to SELL at less than $95 a sq ft! Must see this stunning, custom-built atrium walk-out ranch! This private paradise is tucked away on 2 wooded acres. Main level features: living rm w/ vaulted ceilings, dbl-sided gas fireplace, formal dining. Gourmet kitchen w/ wood floors, 12ft granite island, stainless appliances, dbl conv ovens, 5-burner cook top, walk-in pantry, and built-in work area. Walk-out to new composite deck overlooking your private oasis. 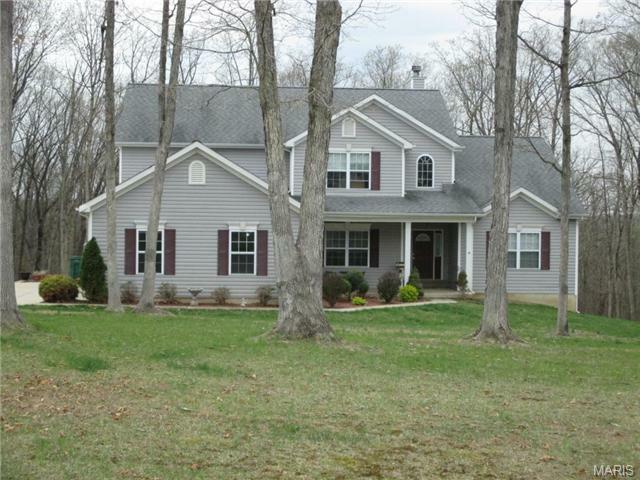 3 generous sized guest bdrms and master suite w/access to back deck. Basement provides all the extras to entertain! Custom wet bar area wired for multiple TV's, w/ dishwasher and refrigerator. Media room w/ stadium seating, family rm w/ fireplace, bdrm, bath, bonus room, and screened-in porch complete this amazing space. Step out to your backyard oasis complete w/ extensive professional landscaping, in-ground, heated, salt water pool, and outdoor stereo. Request info for all the new and replaced features. This unique home has everything you need and more! Custom built, steel frame home on Castle Ridge 18 acre lake! The steel affords the ability to span extra long distances without support beams, the 12 thick walls help for add'l insulation. Walk into a grand foyer with an open staircase, hardwood flooring throughout most of main level! Spacious eat-in kitchen features large island, abundance of cabinets & granite countertops. Large Master suite with incredible views of the lake & its own private sliding doors to the large deck! Large walk-in closet w/ lots of natural light, & an on-suite master bath featuring a whirlpool tub, shower & dual vanities. This home has plenty of space for entertaining with a family room on each of the three levels, formal dining room, butler's pantry, media room, & a large circle drive. All three levels have 9' ceilings so plenty of natural light throughout the home! Recent improvements include new roof & siding in 2013 & new carpet in main level family room 2018! Buyer to verify all MLS data. Welcome to this stately, one-of-a-kind home nestled upon a spectacular 3-acres! This custom-built home features a unique brick/stone front elevation with an expansive front porch and circular drive leading to the side-entry 3 car garage. Around back enjoy the summers in the inground SALT WATER POOL! Inside you will appreciate all the attention to detail from the hardwood floors, transom windows and crown molding to the arched doorways, french doors and handicap accessibility. You will love cooking in the gourmet kitchen with custom staggered 2-tone cabinetry, quartz counter tops and a wine cooler! Right off the kitchen cozy up by the gas fireplace in the hearth room. The master bedroom feels like a retreat with its own fireplace, ensuite bath, custom closet and walk-in shower with TWO shower heads! Head downstairs to the WALKOUT basement complete with a large family room, 4th bedroom with bathroom, kitchen area and media room that will make movie nights a blast! 10 ROOM 1.5 STORY W/ 3 CAR GARAGE AND PLENTY OF STORAGE AND ROAMING SPACE! BRICK AND STONE ELEVATION W/ 2ND STORY ENTRY AND GRAND STYLE ROOMS FOR LARGE GATHERINGS AND ROOM TO GROW. COVERED AND STAMPED PATIO OVERLOOKING WOODED AND OPENED GROUNDS. HARDWOOD FLOORING AND FLOOR TO CEILING FIREPLACE WITH PRIVATE OFFICE AND SEPARATE DINING AREA W/ BUTLER PANTRY AND WET BAR FOR THE HOSTESS WITH THE MOSTEST! CABINETRY W/ SLOW CLOSE AND DOVE TAIL DRAWERS AND GRANITE, COLOR SELECTIONS STILL OPEN FOR DISCUSSION. WALK IN PANTRY AND CENTER ISLAND GREAT FOR ADDITIONAL SEATING . HOW ABOUT HOT PIPING COFFEE ON COVERED PATIO AND STAR GAZING AT NIGHT? LAUNDRY PARLOR RIGHT OFF KITCHEN W/ ACCESS TO GENEROUS GARAGE SPACE. A PIECE OF THE COUNTRY PIE CLOSE TO THE CITY. MASTER PLAN BUILDERS AND THE ESTABLISHED DEER VALLEY DEVELOPMENT WHERE THE DEER AND TURKEY ROAM AND ATV AND RV'S ARE WELCOME UPON APPROVAL. WELCOME TO THE MASTER PLAN DIFFERENCE! Welcome home! This 1977 sq. ft. custom 3BR/2BA ranch home sits on 3 acres in Southern Lincoln County. 9 ft & 12 ft. ceilings throughout the upper level only add to its grander & its open, airy floor plan lets guests visit with ease between the kitchen, breakfast and living room areas. Kitchen features beautiful Cambria countertops, under cabinet lighting, black slate appliances & a HUGE walk-in pantry even the pickiest of chefs would die for. Master bedroom suite boasts a double bowl vanity, separate toilet and a giant luxury shower that has been fully custom tiled. You can even flow easily between the MBR closet and the oversized laundry. Walkout basement with 9 x2019; ceilings and bath rough-in is a great place to finish a family area, rec. room and/or some additional bedrooms if need-be. Drive through detached garage is 36 x 40 and features two large overhead doors and a 8 x 40 lean-to, great for some additional outside storage. 1.7 acres and 4600+ square feet!!! Do not miss the opportunity to own this custom, all brick, one owner home in the beautiful Berkshire Subdivision in Troy. This home boosts 4 large bedrooms, a chef x2019;s kitchen and finished walk out basement. The main level has a large dining room, office with glass French doors, a fantastic eat in kitchen, living room w/ gas fireplace, a four seasons room and 3 bedrooms. The master bedroom has a deck off the back looking out onto the peaceful backyard. The lower level is a walk out with a large bedroom, full bath, study area, exercise room, large family room and a full kitchen. There are 2 fenced areas in the yard as well. If you are looking for a custom, quality built home, look no further . Beautiful 5BR 4.5BTH custom ranch nestled on 3.4 acres lot backing to trees in a quiet cul-de-sac that is ready for you to call it home. Picturesque setting offers lush landscaping w/irrigation sys, brick & stone front, covered porch & side entry 3 car garage. The interior shows like a display w/an open floor plan, new flooring & fresh paint. Alluring entry foyer w/new gleaming HW floors opens to the elegant dining rm. Vast great rm w/tall vaulted ceilings features a WB FP flanked by windows. Gourmet kitchen features custom cabinetry, granite countertops, center island, bkft bar, workstation, pantry, bkft rm w/bay window & door to the deck & patio perfect for outdoor enjoyments. Luxurious master suite w/coffered ceiling offers a LG walk-in closet & deluxe BTH w/dbl vanity, jetted tub & shower. 3 add'l BR, 2.5 BTH, laundry & mud rm on main. The finish walk-out LL provides a LG family rm, media rm, den, 5th BR & full bth giving you over 4290 SF of living space. The list goes on & on! PRICE REDUCED! Pride of ownership shines in this custom built 4 bedroom/4 bathroom home located in desirable Berkshire Estates. This home sits on 2 beautifully landscaped acres that features a heated in-ground pool, hot tub and stocked pond! Inside the spacious ranch is 4 large bedrooms and plenty more space for the family. Kitchen boasts loads of Hickory cabinets and granite counter top space with additional desk area. Kitchen opens to dining room which has a stone wall with see thru gas fireplace. Large living room has integrated surround sound and offers picturesque view of backyard. Master bedroom on main features walk-in closet and private master bath suite. Lower level offers 2 extra bedrooms, family room, billiards room with elegant custom bar! Main floor laundry. Over-sized and heated 3 car garage is 1200 square feet! This show stopping home won x2019;t disappoint! Call your favorite agent today to tour this one of a kind home located in Triad School District. Escape to the woods in this custom built ranch with luxurious features you will love! 11' & 9' ceilings, bamboo floors, arched doorways & gorgeous wood views on the main level. Stunning finishes include a stone fireplace, double crown molding, impressive lighting, granite counters, 42 cabinets, walk-in pantry & stainless steel appliances, including a double wall oven. Private master suite with more wood views has a walk-in closet & spa-like bath with separate vanities & seated tile shower. Finished walk-out lower level with a 9' pour has a rec room, family room, & bed/bath that would make great in-law or teen quarters. Three separate office spaces available to work from home or be crafty. 3+ car garage w/13' bump out for a workshop or additional parking. Brand new paver patio w/firepit coming in May in the irrigated fenced yard. Composite deck. Adjoining 2.03 acre lot also for sale. Only 6 miles from Troy or 20 min from Wentzville, but a world away from the noise. See it today! If your looking for a fantastic home that makes you feel like your waking up on vacation then you must go take a look at this home. The views from this home are breathtaking to say the least! Located on Big Creek in Troy. This home features an over sized garage with insulated, 8' garage doors, garage storage with pulldown steps to attic. Insulated interior walls in home for sound deadening, some Low E windows, custom motorized solar blinds with remote opening/closing at staircase. True vent stove, built in oven and microwave, granite tops at kitchen, custom cabinets with crown & hardware, his and her wic closets at master bedroom, bay window at master bedroom & custom master bath with jetted tub with a view. Custom atrium windows at great rm with vaulted ceiling, open staircase with open spindles to finished LL. Enjoy 2 fireplaces during the winter months a lower level bar and plenty on room for entertaining in lower level. This home is well loved and taken care of. Beautiful Country Living! This 4BR/2.5 BA home with 2800+/- sq ft shed on 21+/- acres is a wonderful place to call home! Home is very well maintained with fresh paint throughout and 2 newly remodeled bathrooms upstairs! The main floor features include: kitchen with custom cabinetry, lazy Susan, buffet and French doors; family room with wood floor and French doors, dining room, and living room! Huge 2800 +/- sq ft outbuilding with workshop area and both automatic and sliding doors. The 21 acres lays beautifully and includes a stocked pond, large garden area, pecan trees, and income producing crops. Seller is offering up to $500 for a Homeowner's Warranty. Some deed restrictions-no mobile homes or junk yards. Come and take a look at this country estate! This impressive new home sits on a wooded and private lot in the much desired Shadowwood Subdivision. This new floor plan features a large open space for easy entertaining and family living, in the kitchen, dining, and living room. Lots of natural light, stone fireplace, custom built-ins all done in the Craftsman style. Mud room has built-in cubbies and there is a large pantry for your kitchen supplies. Master suite with your own spa retreat with dual vanity, walk-in shower, garden tub and oversized custom closet. Upstairs laundry room for your convenience. Lower level is finished with a family room, 4th bedroom and full bath. Adds entertaining for family and friends. Enjoy outside entertaining on covered patio is easy with plenty of yard space and privacy.